If you’re a fan of films then you’ve most likely been to Kingston’s locally owned movie theatre, The Screening Room, a space to indulge in popcorn and experience the thrill of re-watching a classic film on the big screen or a cult classic at a good price. 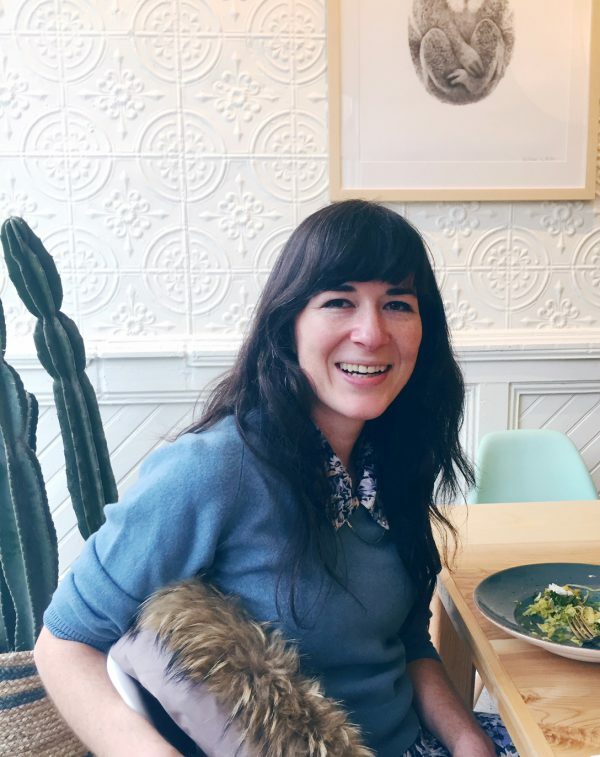 I met with the owner, Wendy Huot, over pints and tacos at Stone City Ales to learn what brought her to Kingston, how she ended up taking ownership of The Screening Room and get the scoop on the upcoming Kingston Canadian Film Festival. What I learned is that Wendy is a kind and ambitious woman who is most certainly a Boss Lady. Learn her story and more in our interview below. What brought you to Kingston? I came to Kingston entirely for work. I was seeking a professional opportunity. I was born and raised in Victoria. I did my bachelors in Computer Science and then I did my masters at library school. Library Information Studies at UBC in Vancouver. Data Management Information Systems and Web Development was what I was cultivating in my professional interests. I knew I had to be prepared to move anywhere. Whatever fit my speciality, I was prepared to move there. I didn’t care if I left the province, I would move anywhere. I only had two requirements. I figured wherever I got a job, it had to be a city that was big enough that you could walk around and didn’t have to own a car because I didn’t have a driver’s license. And my second thing was there had to be a cool video store and a cool movie theatre that would play Art house films. So a job opened up at Queen’s University, Web Development Librarian. I applied to that. This was in 2006. I remember when I was applying to the job I did a quick search of Kingston and made sure it had a video store and movie theatre. I ended up getting a job and thought, “Alright, I’m moving to Kingston.” This was in 2006, I was 23 at the time and I didn’t know anyone in Ontario. I had no ties to Kingston and no ties to Ontario. So I moved here entirely for work and Kingston passed the bar for being moveable without a car and had a movie theatre. And so now that I am the owner of The Screening Room, it is something that is in the back of my mind in terms of quality of life and if Kingston is a place to stay. If you are a movie theatre buff, having a good movie theatre is pretty key to whether you enjoy a city or if it’s a city that you can live in or not. Every so often I will hear that from people, they’ll say, “Having The Screening Room makes Kingston a nice place to live for me.” That’s always nice to hear. So what made you want to stay here? It was nice to move to Kingston when I was still relatively young. At 23, it did mean that I was able to make a lot of friends in Kingston and I kind of became part of the alternative arts and culture scene. Generally in your twenties I feel people are a lot more open and socially flexible so I felt like I had to make friends and fell into some good groups of people. Sometimes I wonder if I had moved to Kingston in my thirties, I feel it might have been more difficult socially to connect with people. So I felt a sense of belonging fairly early on in Kingston. I had friends and good sense of community in Kingston. Growing up in Victoria, I never really felt like that. I had friends but I was very introverted and wasn’t part of some kind of Victoria community. So I did early on feel a sense of belonging in Kingston. And I liked the scale. As time went on I had friends that moved to Toronto and Montreal or Ottawa. And would visit Toronto quite a bit and it was nice to have friends there and visit there. But as time went on I couldn’t imagine living in a big city again. The scale of Kingston is good. If you’re someone who is interested in new experiences and open to new ideas, enjoys experimental art and culture, there’s enough in Kingston to keep it interesting. In some ways it can seem very conservative and in other ways, it’s also a very international city with people coming from all over the world for one reason or another. There’s always interesting new people to meet. How did you start with The Screening Room? After five years of working at the library, even when I took the job in my mind I thought, “Okay, it’s good to have a variety of life experiences.” I tend to chunk things in five year increments. I told myself when I took the job, “After five years, ask yourself, what are some other experiences you can pursue or do you perhaps want to work as a different type of librarian or in a different type of library?” And after five years I questioned what else I might want to do. Either recommit to what I was doing or try something new. And when I was doing that mental exercise I felt I would like to have a new challenge and try something new. But I knew that I did want to stay in Kingston. What was interesting about me taking ownership of The Screening Room was before The Screening Room was even put up for sale, I had actually in my mind had this project where I planned to work at the library for a while but planned to start my own little independent movie theatre from scratch. I liked The Screening Room and I would go there but felt it was ran in a very perfunctory way and they didn’t have classic movies and I am a big fan of the experience of watching a classic film in a movie theatre. There were also a lot of cult alternative movies that wouldn’t come to The Screening Room so I thought maybe there is some sort of alternative niche for an alternative movie theatre that would do more of a classic film program, cult movies and special event programming so I thought maybe I would do my own little single-screen theatre. I was just sort of Googling “How to open a movie theatre.” I bought a little notebook for the project. It was my own little movie theatre ideas notebook. Because most projects start with buying a new notebook [laughs]. I just started brainstorming ideas and then one day I was telling a friend of mine, Sina, who is a real estate agent. I said, “ you know, Sina, I am kind of dreaming and plotting about opening up a little a movie theatre” and he said, “Well, you know The Screening Room is for sale.” And I thought, “How could The Screening Room be for sale?” The idea that somebody who owned a movie theatre would ever want to sell a movie theatre never really crossed my mind as a possibility. So as soon as I heard it was for sale, I had to see if it was possible. I had to pursue it. And it all worked out. So that was 5 and a half years ago, you’ve done your reset and know you’re committed to The Screening Room? One thing I can say is we are planning to renovate and expand The Screening Room. I’ll be making some changes to the physical space. We’ll transition from being a secret place to a place with much more visible presence. What have you enjoyed about owning The Screening Room? I like it quite a bit. It is funny, though, I will say that in terms of my general enthusiasm it is something that fluctuates. Right now in these moment I am like, “I’m living the dream, this is my passion!” I can say this genuinely and then there are other moments where I feel it can be a grind sometimes, there’s a lot of repetition. It’s just work. I am satisfied but there is a lot of reality and passion is not always part of it. In terms status and work right now, particularly in the younger demographic, there’s been a bit of a shift. You get a sense of status not from necessarily how much money you make and what your benefits are, but from whether you are passionate about what you do. To succeed professionally is to be passionate about what you do and proclaim that you would do your job for free even if they didn’t pay you because you’re so passionate about it. But if you feel anything less than that or just fall short of that you almost feel like a failure. It’s almost a way of keeping up with the joneses. So let’s talk about the Kingston Canadian Film Festival.. I am actually on the board of the Film Festival, so I am both someone who has one of the venues that is used for the film festival but I am also on the board. KCFF was actually started by someone named Alex Jansen who worked as a manager at The Screening Room and he started the film festival while he was working at The Screening Room. So the film festival was the initiative of a Screening room staffer way back in the early 2000s. Originally The Screening Room was the only venue for the film festival and now we are one of many venues because it grows a bit every year. I really admire the work that Marc Garniss, the festival Director does. He’s really added more live events and concerts to incorporate them as part of the festival experience to give it more of a celebratory feel. His history is actually doing music promotion stuff so he’s brought that experience. It’s good because for a film festival, you can buy a ticket and watch a gazillion movies but I think it’s really important to have social events. I don’t mind watching five movies a day but most people don’t want to do that. Friday, Saturday and Sunday of the festival is nice. We don’t have to worry about selling tickets, we just serve popcorn and have festival goers come and go. There are people who buy VIP tickets every year so we get to see them every year and reconnect. There are people who come in from media in Toronto so for me it’s an interesting networking opportunity. It’s a great social atmosphere and does a good job of bringing in the filmmakers. It’s a good scale, too, because it’s not so hard to get into the movies at the festival whereas something like TIFF used to be a very moviegoers festival but has become such an important festival from an industry perspective that there are just so many people who go and the tickets are expensive. If you are a regular moviegoer and you want to see a film at TIFF it’s like good luck getting into a movie with someone you’ve heard of. Kingston Canadian Film Festival is a good scale and size for me, just like Kingston. It’s accessible. 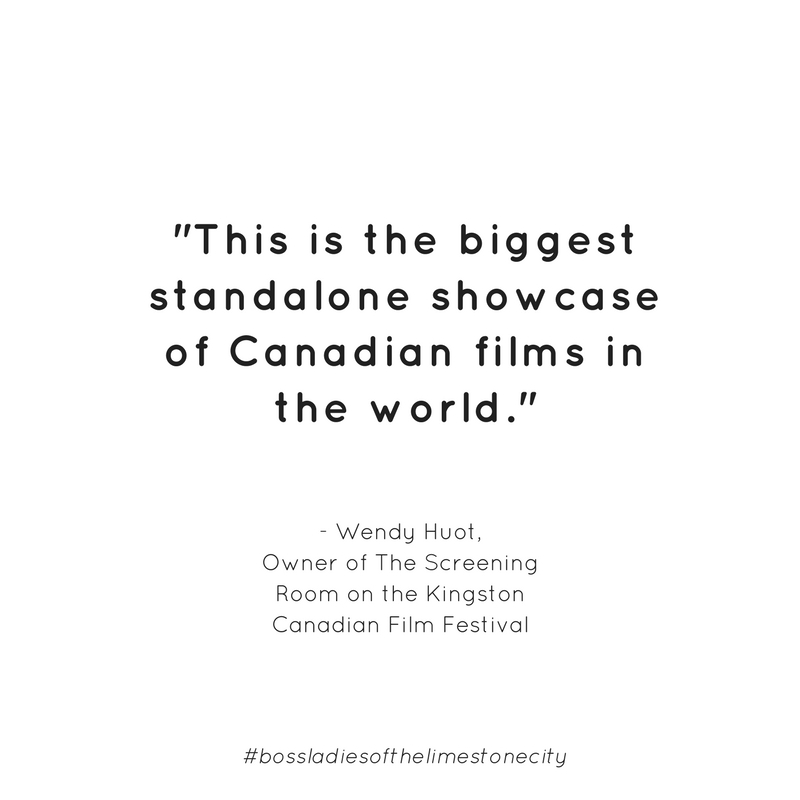 This is the biggest standalone showcase of Canadian films in the world so other cities in Canada have film festivals but they are international film festivals where they play a mix of movies. In terms of a showcase of Canadian films, KCFF has the biggest. Is there anything playing during the film festival that you’re excited about? One film I know is playing at The Screening Room is the documentary, All Governments Lie and it’s produced by Peter Raymont who is a Queen’s alumnus and he’s gone on to have a very interesting career in Canadian film. It’s a documentary about investigative journalism and investigating governments and real entrenched powers and this film would have been made and in development before Trump was elected. A few months ago the title would have felt deeply kind of provocative. Peter Raymont will be in attendance for that. There’s a film called Old Stone, where as far as Canadian Art Cinema goes looks very promising. And there’s another film that is three hours long from Quebec and it’s called Those Who Make Revolution Halfway Only Dig Their Own Grave. I saw part of it at TIFF and it’s this very bombastic, hugely ambitious film about the student protests in Montreal a few years ago. It’s operatic in its scale and ambition. It starts our with a ten minute musical overture. In terms of Kingston, there is actually a film, Live in Kingston, it’s good. The music performances are all really good and it has very charismatic characters. It’s an interesting film. For anyone who has lived in Kingston for any amount of time it will have familiar places and faces in it. Any other Screening Room events coming up? First two things that come to my mind and we do have pages for them on our website so you can just go to our upcoming movies section. We do dinner and a movie events with Olivea restaurant and it’s great because the owners Stev and Deanna, Stev is the head chef and Deanna does the management stuff. So they have control over their menu. They have the will and the inspiration to come up with interesting one-night menus that will tie in with a particular film. So we’ve done a number of these events. We did A Room with a View that took place in Tuscany with a Tusany-themed dinner. We did Julie and Julia. It was a Julia Child’s french-themed menu. On March 20th Tampopo which is a Japanese film from 1985 about a Ramen stand and Japanese street food where you have these outdoor stands where you sit at the stool and get your ramen soup. It’s this film from 1985 and it’s been restored and got it’s theatrical release. So it’s played at TIFF Bell Lightbox and is playing right now at movies across Canada and the US. It’s a funny, interesting film that is really jokey and sort of about the Ramen business. It takes cues from Western films. It sort of has a Magnificent Seven spaghetti western kind of narrative to it. It’s just this weird, funny film. So we’ll be playing that on Monday night and Olivea will do some kind of Japanese menu which will be interesting. We will also be playing it on the Sunday before that. So you can do the Olivea night or come on Sunday and go to Sushi Bar Da, I know they do Ramen. And then on April 10th we are playing a film called Babette’s Feast which is about French fine dining and then their doing a french menu.